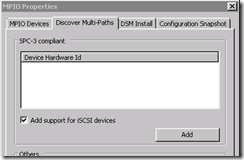 Hello, this is more a post to remind myself on how to install MPIO on Hyper-V R2. I’ve been experimenting with MPIO and my WSS server’s to make a more robust cluster, and need to use MPIO to have proper failover when maintaining the iSCSI /SAN network. Reboot when ready. 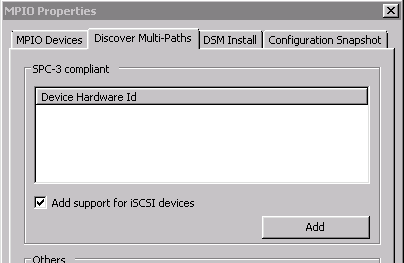 Once rebooted, simply add a new session to your iSCSI target, and you can then use the MCS/MPIO to verify and set the MPIO configuration (round robin or failover only). Using this, I have verified I can get double the throughput when using two interfaces on an WSS target.